Happy Saturday all! I am so excited that we have NO plans/commitments this weekend and can maybe find some time to relax – yeah! After passing out last night at like 9 pm (such a party pooper huh), I woke up today at 5:45 am wide awake. So much for Saturday morning sleeping in LOL. 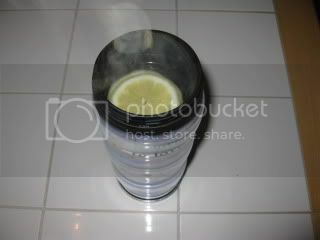 I packed up my Morning Burst (lemon & hot water) to go to take to my Weight Watcher meeting. 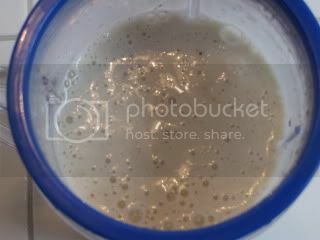 When I got back home, I whipped up a quick Banana Smoothie for breakfast. It was absolutely delicious and refreshing. I am surprisingly full too – yeah for that! I know I will be getting a decaf coffee at The Bucks (Starbucks) today because I told The Husband I’d buy him one for helping me drop off my car to get my breaks done and taking me to the Farmer’s Market. Congratulations ladies!!! Please email me your snail mail addy so I can get the good out to you all. Kristi & Hop – you both get to pick from the remaining 2 flavors (Sea Salt & Pepper or Nacho). The first to email gets first dibs. All of these ladies have fantastic blogs, be sure to click on their names and check them out. Thanks everyone for playing along in my Mr. Krispers giveaway! No worries if you didn’t win Mr. Krispers, you can sign up to join us for Bikini Bootcamp Month and be entered to win a FREE copy of the Bikini Bootcamp Book. Click HERE to find out how. We are off to get our day started ~ Farmer’s Market here I come! See you all for a fantastic salady lunch! Ahhhhhh!!!! Yay!!!!! Thank you!!!! I am one of those "always enter never win" girls so this is very very cool! I spent an entire summer weighing with my eyes closed. It is super hard at first but eventually it totally helps you focus on your program and not on just manipulating the numbers on the scale. Good job not peeking! Wow, you have a ton of will power for not peeking! Good job! Hey pretty lady! Let me know if you need my address again or not! YAY on the great weigh in! I bet you lose 5 lbs in the 2 weeks. I am so excited because we're at my family's place in VT and last night was my TOTAL indulgence night during which I enjoyed 4 glasses of wine, a petite filet minon, amazing salad, and pudgefre brownies and I don't feel deprived but had a blast! We spent all day walking the golf course while playing so I woke up wto have lemon water (hot!) and am enjoying the morning peace! C.G Foodie ~ Congrats on winning. You know what – that is exactly it! I am still focused and not swayed either way – thanks for saying that, it really helps me not peak. K~ Thanks, I know it was good since she said it was good, really good so that is motivating too! Ashley ~ It sounds like you are having a fabulous time in VT. Don'tcha just love the lemon water? I do.